This week for my Sunday Painting I decided on something rural and Springy. We spent the last 24 hours out in rural Maryland, about 10 miles from Gettysburg, Pennsylvania. Friends of ours own Whitmore Farm and we had a wonderful time with them collecting, washing, sizing, and sorting these beautiful eggs. Plus we helped tag a lamb that was born over night, clip and clean goat hooves, and move new born chicks out of the incubators into their warm halfway house before they head out doors to begin their lives lunching on grass. With all these English Journey books I am reading, I felt right at home on the farm. It kills me that we forgot the camera at home since the farm was so green and lush, much like this beautiful image of Marin County, California. What beautiful looking eggs! 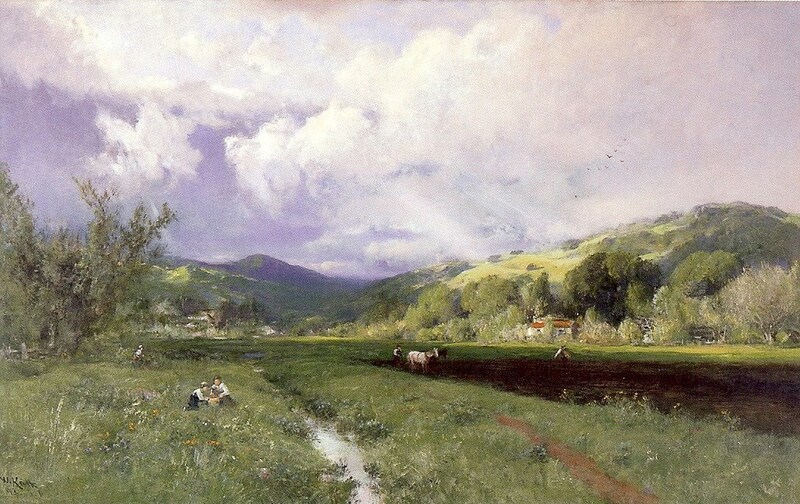 And I love the painting of Marin County. Sounds like you had a lovely day! What a super day! 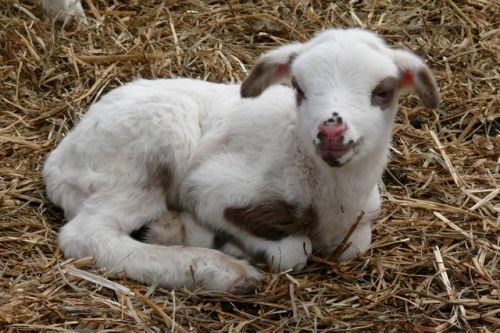 I love the picture you chose, and that lamb is adorable. The eggs look so wonderfully fresh. 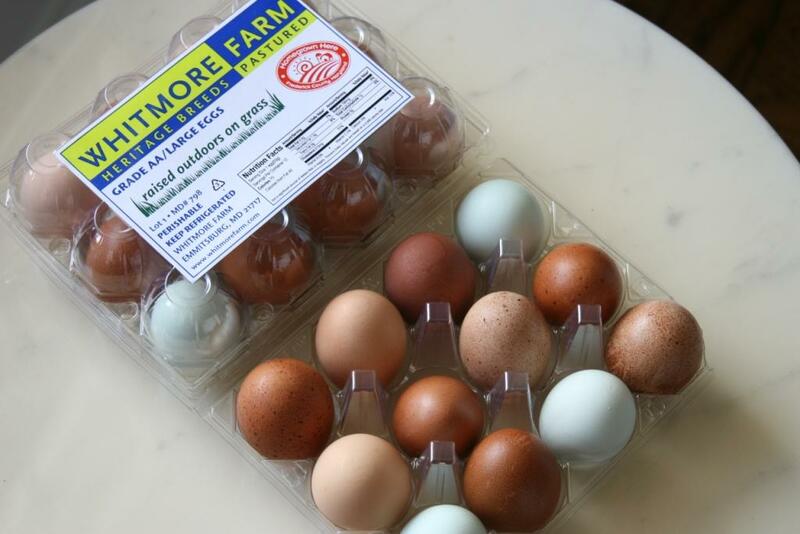 It's so lovely to see eggs in all the different colors. 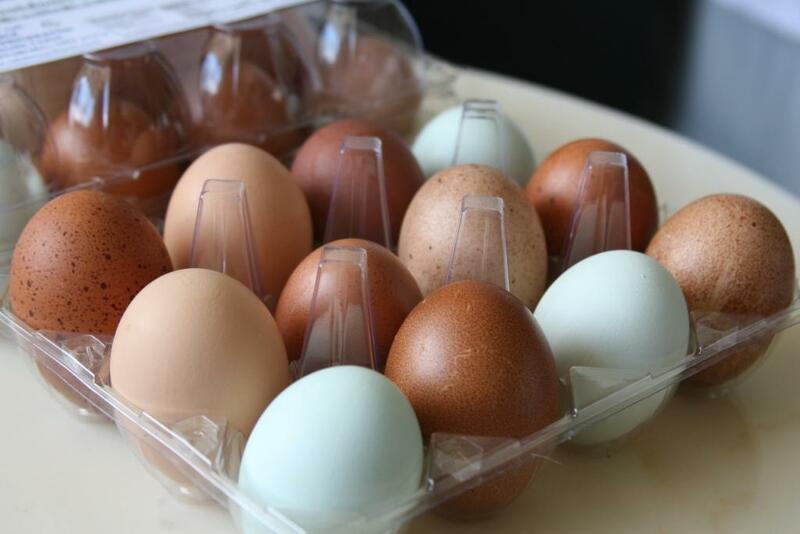 I try to buy organic or free-range eggs when I can, but even then they're sorted in the supermarket between white and brown. Rambling Fancy: It was quite a lot of fun. Glad I don't have to do those chores every day like our friends though. Skirmish of Wit: Amongst all their sheep and goats they had about 5 sheep that had been bottle fed when they were lambs and they follow you around like friendly dogs when you are in the pasture. It is quite sweet. Jeane: Actually those eggs are really pale blue. If I put a white one next to them you would be amazed at the color. Ooh, really? I thought they looked kinda bluish but assumed it was my monitor tweaking the color. That's so cool! I've never seen a blue-tinted chicken egg. What a lovely pastoral scene. And those eggs! They are almost too pretty to crack open. Thank you so much for your recent visits and comments. Jeane: It is like looking at white paint samples. Seen alone they all look the same, but when you put them next to each other you start to see all the variation in hue. Marianna: They are too pretty to crack open, but when you do the yolks are the most amazing bright yellow/orange. Nothing like what one finds in the supermarket here in the US.